Coleraine have confirmed Eoin Bradley and Brad Lyons are facing up to two months out of action through injury. 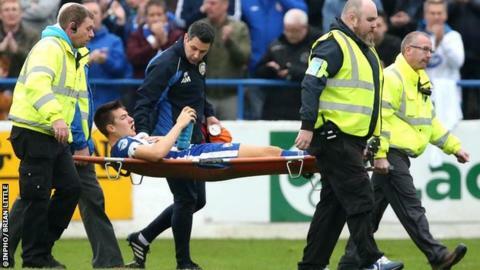 Lyons will be sidelined for six to eight weeks after undergoing surgery to repair both of his cheekbones, which he fractured during the win over Linfield. Bradley is facing a similar recovery period after scans revealed he had suffered a knee ligament injury. The Bannsiders are five points clear at the top of the Irish Premiership and remain unbeaten after ten games. "It's a bit of a double whammy," said Coleraine manager Oran Kearney. "Brad will be out for at least six to eight weeks, if not more. "We won't be rushing him back and we will make sure he is 100 per cent fit and ready before he returns. "It helps that he can train away from the team in a couple of weeks, so when we get the go ahead, he will be fit and raring to go." In a further blow, Bradley has a knee ligament injury that he picked up during the win over Ballymena last month. "You are talking six to eight weeks, but we all know that Eoin is a quick healer," Keaney added. "It is disappointing to lose both players as they are important to the team."